Shabby Chic Staging With Revolutionaries! I wanted to take a moment and share a project that I was asked to help stage for my friend Bonnie's blog. Let's get a little bit of backstory... I met Bonnie Getchell 8 years ago at Truett McConnell. We became instant friends and had so many creative things in common from day one. Fast forward 8 years later and we are still best friends and pursuing our creative dreams in both music and decor/creative services. Bonnie refinishes furniture, among other things, and while I was up visiting she had this bench she had just finished for one of her clients. I fell in love with the piece immediately. She asked me to stage it for some photos for her blog and of course I jumped at the chance. Who wouldn't want to decorate a cool piece of furniture that you didn't have to purchase, right? Any who, I love the way the staging came out. We wanted something cozy and inviting to go along with the feel of the bench being worn in. Hope you like the finished look. If you are interested in having a piece of furniture refinished, you can contact Bonnie at www.revolutionariesblog.com. There is some very exciting news coming about her journey that I don't want to give away yet. I will update everyone on that here when the time comes, so stay tuned. 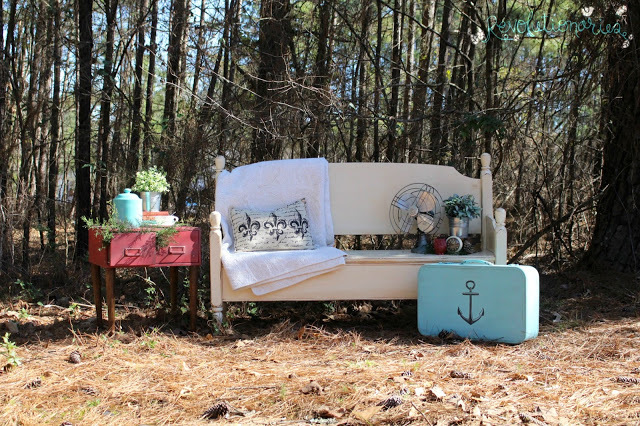 If you would like to read Bonnie's blog post about the bench redo, you can do that here. The new >>> SHIMMER COLLECTION <<< coming soon.